A great many of us will be in need of care during our lifetime, mainly when we grow old. It is likely we will have to gather together the resources we already have, as well as look for new ones to support us, particularly the longer we live. Care arrangements depend a great deal on where we live, which services are available to support us if we become ‘dependent’, and how “care systems” function. The majority of research has shown that care remains a family task even in those contexts characterized by generous publicly funded personal services, as in the Nordic European countries. But in the Mediterranean “care regimes”, this task is taken for granted. A kind of “implicit familialism” is in place because of the huge duties assigned to families by policies (or the absence of them) assuming that family members are always capable and available to provide care. In these care regimes formal services are indeed scarce and intervene only residually, in very urgent and complex cases. This approach is embedded in social policies as well in the wider normative framework, for example concerning financial responsibilities towards relatives. In the presentation, Associate Professor Giuliana Costa illustrated and discussed the main elements of the Mediterranean care regime focusing on the Italian case: the lack of in-kind services, the existence of unregulated monetary supports for long term care, the centrality of families and the emergence of a ‘private to private’ solution that is peculiar to Italy, and which is attracting care workers from Eastern European countries. As a matter of fact, growing long-term care needs are supported by few existing formal public services and rely heavily on the informal care provided by family members and the help of private assistants, the so-called “badanti” (care-workers). These care workers are mostly migrant women and are filling the existing care gaps within the Italian welfare state. Giuliana will present the dilemmas related to this policy pattern as well as the most recent proposals to overcome it. 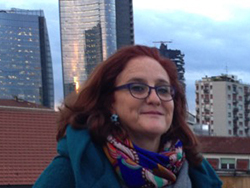 Giuliana Costa is Associate Professor in Sociology at the Politecnico di Milano, Department of Architecture and Urban Studies (Dastu). She teaches “Urban and Social Analysis” in the Bachelor of Science in Urban Planning and “Urban Sociology” in the Master of Science in Architecture. Her research activities are related to comparative welfare at the local, national and supra national levels, mainly related to long term care issues as well as to the nexus between care and housing for different vulnerable populations. She is a leading scholar on domestic work and care activities regulative policies. She has published extensively on these issues and she is committed to developing policy solutions to cope with needs related to care both for public agencies as well as for non profit organizations.